American general, born at Albany, New York on the 6th of March 1831. His early life was spent in a country district in Perry county, Ohio, and he proceeded to West Point in 1848, graduating in 1853. He was assigned to the infantry and served on the frontier and on the Pacific coast, gaining some experience of war in operations against the Indians. At the outbreak of the Civil War in 1861 he had just become first lieutenant, and soon afterwards he was promoted captain and entrusted with administrative duties in the western theater of war. Early in 1862 he was commissioned colonel of the 2nd Michigan cavalry, with which he served in Halleck's army on the Tennessee. In June he was placed in command of a cavalry brigade, and a month later he won promotion to the rank of brigadier-general U.S.V. by his skilful conduct of the fight of Booneville on the 1st of July. He took part in General Buell's campaign against Braxton Bragg, and led the 11th division of the Army of the Ohio at the hard-fought battle of Perryville (October 8). Sheridan distinguished himself still more at the sanguinary battle of Murfreesboro (Stone River), and on the recommendation of William S. Rosecrans was made major-general of volunteers, to date from the 31st of December 1862. His division took part in Rosecrans's campaign of 1863 and a very distinguished part at Chickamauga and Chattanooga. Sheridan's leading of his division at the latter battle attracted the notice of General Ulysses S. Grant, and when the latter, as general in chief of the U.S. armies, was seeking an "active and energetic man, full of spirit and vigor and life" to command the cavalry of the Army of the Potomac, Sheridan was chosen on the suggestion of General Halleck. The extraordinary activity of the Union cavalry under his command justified the choice. Sheridan's corps took part in the battles of the Wilderness and Spottsylvania Court House, incidents of which led to a bitter quarrel between Sheridan and George Gordon Meade and to Sheridan's being despatched by General Grant on a far reaching cavalry raid towards Richmond. In the course of this was fought the battle of Yellow Tavern, where the Confederate general Jeb Stuart was killed. After rejoining the army Sheridan fought another well-contested action at Hawes' Shop and took and held Cold Harbor. After the battle at that place Sheridan undertook another raid, this time towards Charlottesville (June 7-28), in view of cooperation with the army of General David Hunter in the Valley. In the course of this was fought the action of Trevilian's Station (June II). A little later came General Sheridan's greatest opportunity for distinction. He was appointed to command a new "Army of the Shenandoah" to oppose the forces of General Early, and conducted the brilliant and decisive campaign which crushed the Confederate army and finally put an end to the war in Northern Virginia. The victories of the Opequan, or Winchester (September 19), Fisher's Hill (September 22) and Cedar Creek (October 19), produced great elation in the North and corresponding depression in the Confederacy, and Sheridan was made successively brigadier-general U.S.A. for Fisher's Hill and major-general U.S.A. for Cedar Creek. "Sheridan's Ride" of 20 miles from Winchester to Cedar Creek to take command of the hard-pressed Union troops is a celebrated incident of the war. His capacity for accepting the gravest responsibilities was shown, not less than by his handling of an army in battle, by his ruthless devastation of the Valley -- a severe measure felt to be necessary both by Sheridan himself and by Grant. From the Valley the cavalry rode through the enemy's country to join Grant before Petersburg, fighting the action of Waynesboro, destroying communications and material of war, and finally reporting to the general-in-chief on the 25th of March 1865. A few days later the indefatigable Sheridan won the last great victory of the war at Five Forks. The operations were conducted entirely by him and were brilliantly successful, leading to the retreat of Robert E. Lee from the lines of Petersburg and the final catastrophe of Appomattox Court House. In the course of the battle of Five Forks Sheridan once more displayed his utter fearlessness of criticism by summarily dismissing from his command General G. K. Warren, an officer of the highest repute, whose corps was only temporarily under Sheridan's orders. The part played by the cavalry corps in the pursuit of Lee was most conspicuous, and Sheridan himself commanded the large forces of infantry and cavalry which cut off Lee's retreat and compelled the surrender of the famous Army of Northern Virginia. Soon after the close of the war Sheridan, who by these services had gained his reputation as one of the greatest soldiers of the time, was sent to exercise the military command in the southwest, where a corps of observation, on the Mexican frontier, watched the struggle between Maximilian and the Liberals. General Sheridan stated in his memoirs that material assistance was afforded to the Liberals out of the U.S. arsenals, and the moral effect of his presence on the frontier certainly influenced the course of the struggle to a very great extent. Later, in the Reconstruction period, he commanded the Fifth Military District (Louisiana and Texas) at New Orleans, where his administration of the conquered states was most stormy, his differences with President Andrew Johnson culminating in his recall in September 1867. He was then placed in charge of the Department of the Missouri, which he commanded for sixteen years, and in 1869, on Grant's election to the presidency and Sherman's consequent promotion to the full rank of general, he was made lieutenant-general. In 1868-69 he conducted a winter campaign against the Indians, which resulted in their defeat and surrender. During the Franco-German War of 1870 General Sheridan accompanied the great headquarters of the German armies as the guest of the king of Prussia. 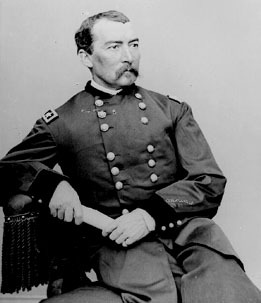 In 1873, at the time of the "Virginius" incident, when an invasion of Spain was projected, Sheridan was designated to command the United States field army. In 1875 he was sent to New Orleans to deal with grave civil disorder, a duty which he carried out with the same uncompromising severity that he had previously shown in 1867. In 1883 he succeeded Sherman in the chief command of the United States army, which he held until his death at Nonquitt, Massachusetts on the 5th of August 1888. A few months previously he had been raised to the full rank of general. As a soldier, Sheridan combined brilliant courage and painstaking skill. As a fighting general he was unsurpassed. Few of the leaders of either side could have stemmed the tide of defeat as he did at Stone river and turned a mere rally into a great victory as he did at Cedar Creek, by the pure force of personal magnetism. His restless energy was that of a Charles XII, to whom in this respect he has justly been compared, while, unlike the king of Sweden, he was as careful and vigilant as the most methodical strategist. He was a devout Roman Catholic, and in his private life he had the esteem and admiration of all who knew him well. General Sheridan was president of the Society of the Army of the Potomac and of the Society of the Army of the Cumberland, the latter for fourteen years. In 1875 he married Irene, daughter of General D. H. Rucker. His Personal Memoirs (2 vols.) were published soon after his death.